Fly to pure, unspoiled wilderness. Plan an unforgettable group experience. The perfect trip for your entire family. Experience some of North America’s best fly-in fishing and accommodations in the beautiful wilderness of the Wabakimi Provincial Park in Ontario, Canada. 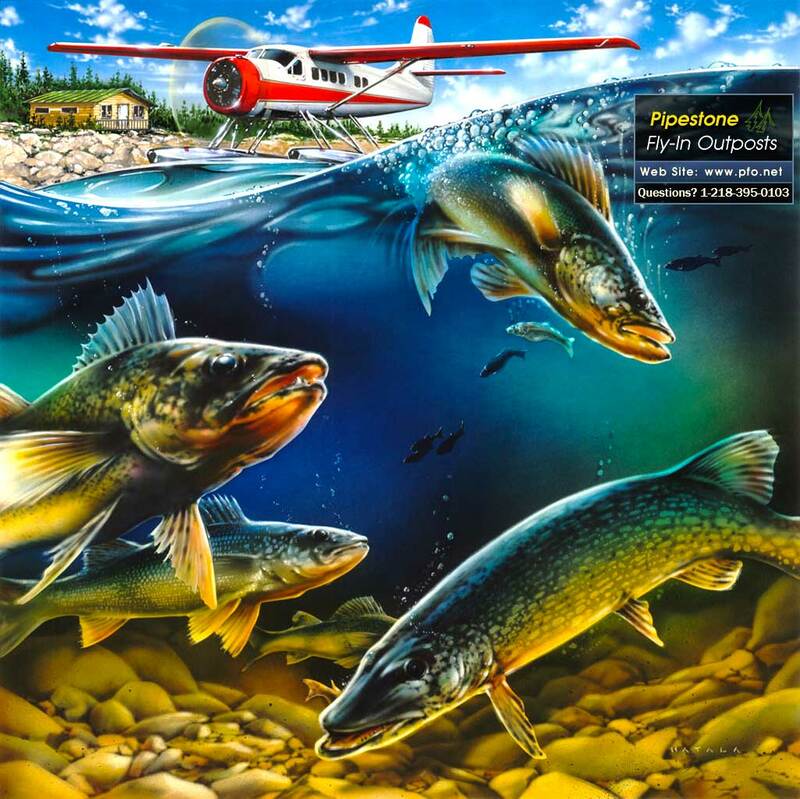 Fishing at Pipestone Fly-In Outposts for Walleye, Northern Pike, Lake Trout, and Brook Trout is exceptional. Come see for yourself what it is like to enjoy World Class Fishing in the beautiful Canadian Wilderness..
We fly you to the magnificence of untouched hinterland, accessible only by float plane, free of logging roads, crowds and the stress of daily living. We offer a choice of five fly-in outposts located 220 miles north of our base and an additional boat-in lake just 10 miles from our base. We are located just an hour from the International Falls, MN / Fort Frances, Ontario border. Our comfortable outposts are designed for people who want a wilderness vacation without a schedule. Come and enjoy a remote Canadian fly-in fishing trip! Pipestone Fly-In Outposts operates five of the best Canadian fly-in fishing outposts in the Wabakimi Provincial Park. Only accessible by air, this vast region offers untamed wilderness and beauty free of logging roads, crowds, and the burdens of daily living. Listen to the rapids of the rivers, the cry of the loon and experience the silence, solitude and freedom of the wilderness. Although you’ll be dropped off in an otherwise impregnable location, our cabins are fully equipped to ensure the comfort and safety of your group of up to 10 people. Our cabin locations were intensively surveyed and selected for easy accessibility to great fishing locations and spectacular views. Even our busiest guests settle into the relaxing setting very rapidly and forget about their daily grind. Let us know what kind of fishing adventure you’d like to have and we’ll be glad to help you plan an amazing trip. Pipestone Fly-In Outposts is still a leader in dream fishing adventures and is building their business on the same basic principles established in 1986: GREAT SERVICE, CONSERVATION, AND LOVE FOR THE OUTDOORS! I want to thank both of you for all of your help with our fishing trip, you folks are the best. If you ever need a reference, please let me know. I always tell everyone I talk to, that involves fishing, that you are the outfitter to go with. We have NEVER been disappointed with anything on any of our four trips. They just keep getting better! It takes a lot of work and you folks know what it takes and getter done! We had a great trip to Coles Lake. Everything went well with the weather, cabin and boats. The fishing was very good as we caught some of the biggest Walleye of our 48 trips to Canada. The biggest fish which had an “official” measurement was caught by Wendell. It measured 25+ and was very heavy. Lonnie caught the “unofficial” Queen Walleye of 27 plus. Eli’s fish was so large that I could not get it in the boat. (We did not leave the net behind anymore after loosing that fish!) We caught several 21-23″ Walleyes and Wendell caught a 36+ Northern. The big fish were caught in high wind conditions on either diving or shallow running shad raps. Many of the 21-23″ walleye were caught on 2 1/2″ sassy shads or 2 1/2″ fluke or Berkley minnows. Our food supply was great and planned out almost to the hour. The cabin was great with the best camp shower we ever had and the boats ran great. The side trip to August Lake was “awesome” as Eli would say. With Mike’s help, we caught near 150 fish in about 3 hours. Nearly all were Walleye in the 18-24″ range. It seemed Eli was saying “got him” every 3 minutes. Altogether, we figure we caught 800 plus fish. The Eagles, Osprey, Gulls, Whiskey Jacks, five Loons and 2 chicks, a pine squirrel all provided an array of sights and pleasure. Thanks for all you did to make our trip very enjoyable and memorable. We all realize you did more, a lot more, than what was required. This is what makes you premier outfitters but more importantly “special friends”. We hold your kindness a dear. 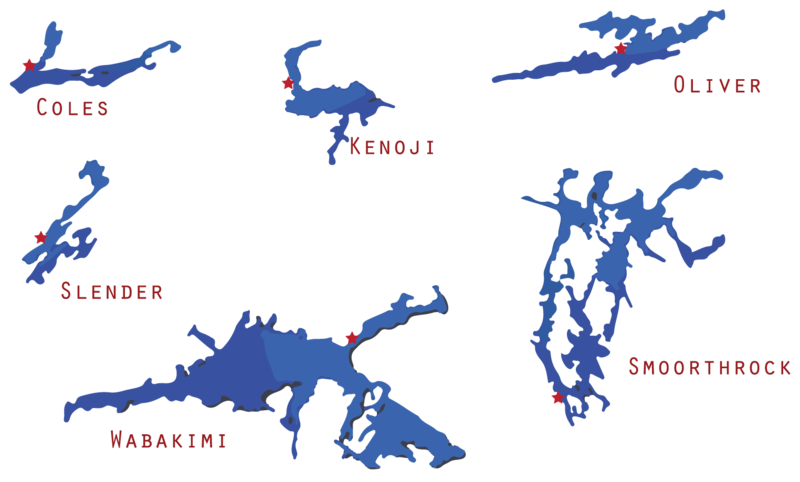 We look forward to our trip this fall to Kenoji. I’d like to let you know how much we enjoyed our recent trip to Oliver Lake. We had probably our most enjoyable trip ever with you. We had a wonderful time at Wabakimi Lake a few years ago but Oliver Lake is our favorite and we would recommend it to others. You were an excellent host and very fair to us. Checking in to see what our dates are for our 5 day trip to Kenoji in 2011. My group really enjoyed themselves last week. Each spoke highly of you both and how great you treat your customers. Kenoji is a beautiful place and is full of fish. I am already looking forward to next years trip. Thank you so much for our trip to Smoothrock. I have been to Canada for the last thirty one years, sometimes three or four times a year and have not caught the amount or the size of walleyes we caught in July on Smoothrock. We’ll see you in May next year. Thank you Mike for being such good hosts on our recent trip to Smoothrock Lake! The Team Group had a great time and the fishing was terrific. Even some of us rookie fishermen caught some very nice fish. My 38″ Lake Trout was certainly the highlight for me! Once again, this year’s fishing was fantastic! Dad and I traveled this year with two buddies new to Wabakimi Lake. One buddy indicating “this was the best vacation of his lifetime times three” and the other wore a large smile all week! Everyone in our group caught at least one trophy fish and some many more. 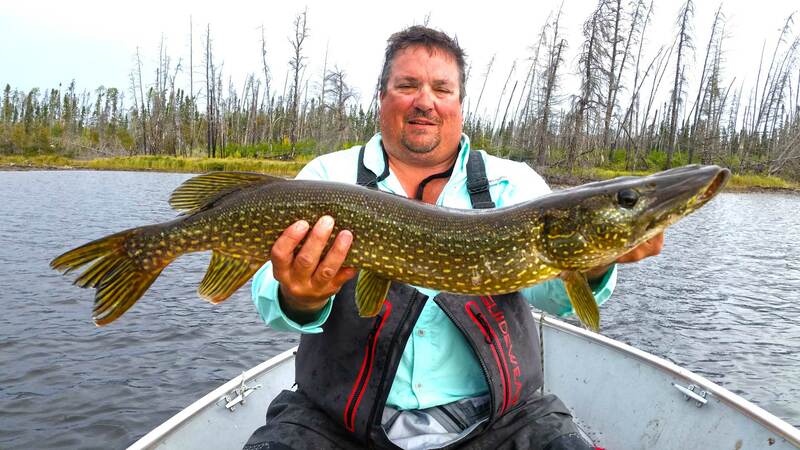 We caught 270 pike for the week, 22 of them over 30″ and 11 of them 40″ and over, with the largest Pike measuring 46″. What great fighters these large Pke are – fat – healthy and mean! Oh yeah, while not even trying to catch Walleye, we always hooked plenty to eat each night. This was my fifth trip here and still found new spots to fish – SIMPLY AMAZING! Big Pike for the week: 30″, 30″, 30″, 31″, 31″, 32″, 32″, 33″, 35.5″, 36″, 39″, 40″, 40″, 40″, 40″, 40″, 40″, 41″, 41″, 41.5″, 42″, 46″ and numerous pike in the 24″ to 28″ range! We want to thank you for the best Canadian fishing experience of our lives! Your level of professionalism and customer service is second to none. The accommodations were outstanding and the fishing was fantastic! It was so great we booked our trip for next year. The cabin on Slender Lake was secluded in the Canadian wilderness with all the modern conveniences of home. Our experience fulfilled all of our expectations and more. We are highly recommending Pipestone Fly-In’s to all of our friends and clientele. See you next September. Thanks again! My third year in Canada and fishing was great this year! Our group of four caught over 300 fish in five days at Wabakimi, throwing back 17-19″ walleyes like they were small Perch! The Northern were hot this year. We caught more than a dozen over 30″ including my Dad’s 38″ and my 45″!! You guys run a first class operation. No reason to consider any other outfitter! See you next year. Just want to again thank you for your kind hospitality and the great fishing experience we again had this year at Wabakimi Lake. Here is a picture of my 43″ Northern Pike. I also had a 39″ Pike. The amazing thing about these two fish is that I landed both of them on a walleye set up with six pound test line (ie no steel leader). In both cases when I set the hook I caught the fish with the jig at the outer edge of the mouth so the teeth didn’t break the line. Also, both times I thought I was hung up on the bottom and when we moved the boat closer to loosen the jig the line started to move so I then knew I had something more than a rock on the end of the line! No question we caught more big Northerns this trip than any of the past six years. Our group had 2 – 36 inchers, a 38 incher, a 39 incher, a 42 incher, a 43 incher and a 45 inch Northern. What great memories! Best wishes to you for an enjoyable summer and we are already looking forward to 2009! Thank you for the most remarkable fishing I have ever experienced! You have a first class operation! During my trip at Smoothrock Lake I boated my 4 largest northern to date, my first lake trout and more walleyes than I could catch in an entire season here at home, not to speak of the unbelievable scenery and wildlife. The only bad part of the trip was leaving! I had a good time and enjoyed each of the trips with you. Thanks for your hospitality and making these trips a memorable experience. These have been some of my greatest fishing experiences. I want to thank your for yet another great trip this year. Dad and I have fished numerous lakes across the US and Canada and Wabakimi surpasses them all – by far!! What a great lake!! The cabin, the equipment, boats everything are always well kept! You do an outstanding job at taking care of your guests. You’ve given us great memories which we’ll never forget! I would like to again say thanks for a great trip this past week. Your level of devotion to the needs of your customers was unmatched by any other outfitter we have been with. Your service was top notch! Thanks!!! Just returned from my 3rd year in a row to Kenoji Lake. The six of us had a great trip, beautiful weather, no rain all week. We caught 3 big Northerns, 44″, 42″, 39″ and several more in the 30″ range. We also caught plenty of Walleye to eat. What a great place to go fishing. When we got back to the airbase Mike sat down with us for an hour while we told him our stories. I believe he could have talked all day if we would have stayed. Thanks for another great fly-in. The fishing was as good as our very first trip to Coles four years ago. We caught and released numerous 21 to 23 inch walleyes…and of course some really nice 25 and 26 inch walleye. We didn’t try to count our total catch, we were too busy catching fish, it had to be in the neighborhood of 1400 to 1600 fish in 6 days of fishing and that included two relatively slow days when the wind picked up and the temperatures were in the mid to upper 40 degree range. We had a great time. All the accommodations were first class as usual. We look forward to our return trip next year. We had yet another successful trip this year. We had a lot of fun and are looking forward to more trips in the future. The service and the facilities you provide are wonderful and the fishing is excellent. We’ve been coming up to Smoothrock for quite a while now and we have never been disappointed. We had gone on a few fly in trips with other outfitters before going with Pipestone Fly-In Outposts and I would say that we were disappointed most of the time. Pipestone Fly-In Outposts was our last straw. We thought if this didn’t work out and we didn’t have fun, we would probably stop taking these trips altogether. Instead you have helped us establish what has become a family tradition for years to come. Thanks again for another great trip! I can’t begin to tell you what a wonderful feeling it is to see my boy have so much fun for a full week! We all had a terrific time, caught countless fish and enjoyed ourselves every bit as much as last year. You guy’s run an excellent outfit and we’re already looking forward to next year! We had another great time this year. We caught scads of good Northern. The 40″ Northern I caught was followed by a 42″ monster just two hours later. The first one came in after a 45 minute endurance contest. I was using an ultralight rig with 6 pound test and a walleye jig. The second one hit a black and gold Mepps #5 in one of the backwater areas – what a day! Thank you so much for an awesome trip!. You guys work hard and we appreciate it! We just loved Oliver Lake, it is a gorgeous lake. The portages are beautiful too, the wildlife, spending time together with friends and the fishing were all so great! Thanks again for your superior level of service. We had a great time on Kenoji Lake. I’ve always wanted to go on a Canadian Fly-In fishing trip my whole life and you helped make it everything I always thought it would be and more. The accommodations and fishing were absolutely outstanding. You run a first class operation. We look forward to seeing you again next August. I just want to say thanks for a great time that our whole group had at Oliver Lake. The quality fishing and catch and release program that you have going there is excellent. Let me know what you have available for next year. I might just have to call in to work with PIKE-IDUS!!! Thank you for taking the time and extra effort to make our fishing trip a pleasure and not a burden! In my opinion that’s what makes you the BEST! What a great fishing trip again. It seems like every year we gain about 3/4 of an inch on the walleyes. Just goes to show you what that Catch and Release program is doing to the fishery. Thanks for my first 30″ Walleye. We will see you guys again next year. You told us we would be hooked for life and you were correct. Thank you for the greatest 7-day fishing I have ever experienced. Great hospitality and accommodations. See you again in August. Just got back from our 4th year in a row fishing on Kenoji Lake. I took along my nephew and 2 Fathers took their sons. We all caught Northerns and plenty of Walleye to eat each night for supper. Can’t wait until next August. Thanks Mike for a Great Trip!! Use this form to tell your friends about Pipestone Fly-In Outposts. A brief description of who we are and what we offer will automatically be included in the email as well as a link to our website. You may also add your own personal message below. Fishing has never been so exciting! Have an additional message to send your friend? *Your message will only be forwarded to your friend. We do not keep a copy of your message or collect your email address with this form. You will not be added to a mailing list.